Good morning! 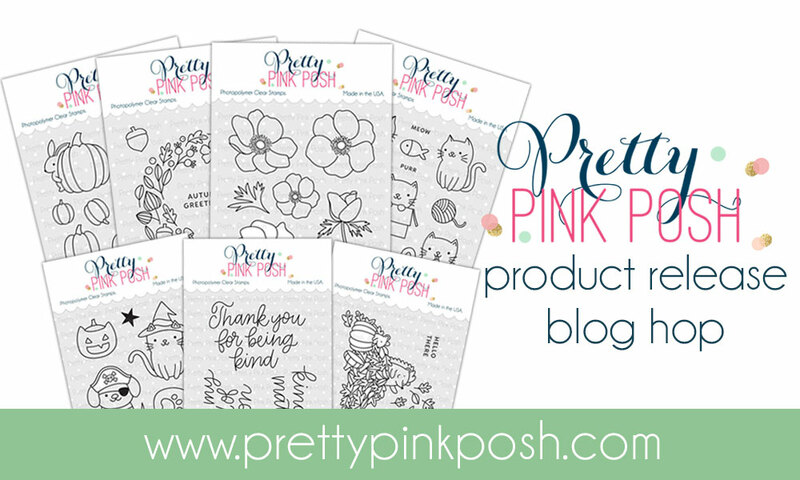 Today I'm helping to kick off the first day of a two day blog hop to celebrate the Pretty Pink Posh September Release! This release is HUGE and packed full of fun goodies - stamps, dies, new jewels - SOOO much fun! You can check out the entire release HERE. There is TONS of inspiration to be found along the blog hop - and a few fabulous giveaways as well! Today I'm share a peek at two cards that will be part of a card class I'm teaching early next month at Impress Rubber Stamps in Tukwila, Washington on October 6th! Sooo...Seattle area locals, you can find info on how to sign up for the classes HERE - and these Pretty Pink Posh classes have been pretty popular in the past, so if you are interested, make sure and sign up soon! More info on the classes at the end of this post! 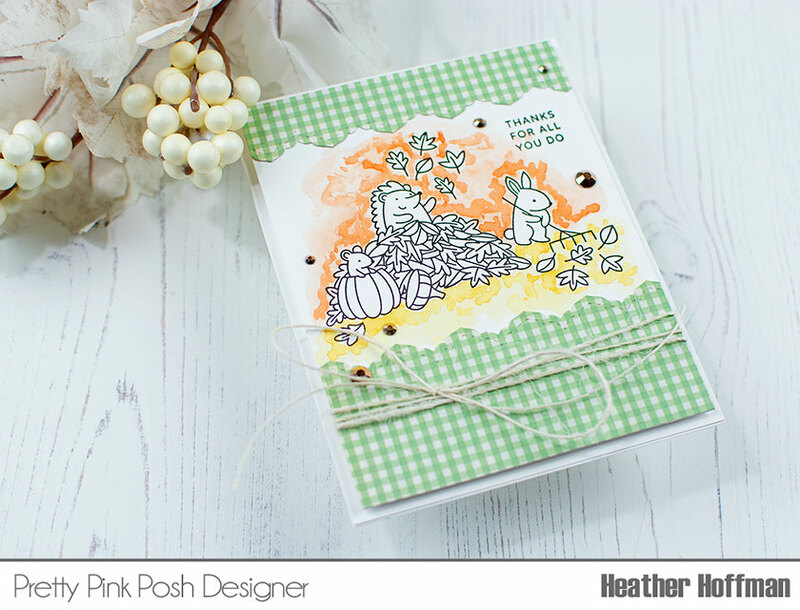 This first card (which will be part of the afternoon class) features the adorable new Fall Scene Stamp set - oh how I LOVE these sweet little critters playing in the leaves!!! I added some of the new Espresso Jewels (I absolutely LOVE this new color!!!). I also used Stitched Borders 2 from a previous release for the border. 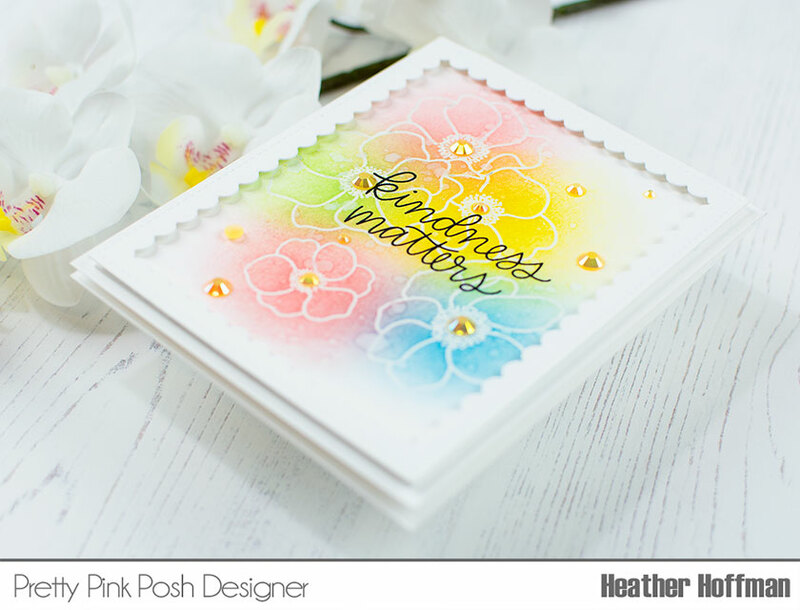 This second card uses the gorgeous new floral set, Anemones, and quite possibly my new favorite sentiment set - Simple Sayings: Kind. I did some dual layer embossing on this, and blended Distress Inks over the top in some bright happy colors. Finished off with some of the new Marigold Jewels (such a fun happy yellow color!) and a frame die cut using the older Scallop Frames dies. Now - onto the class info! 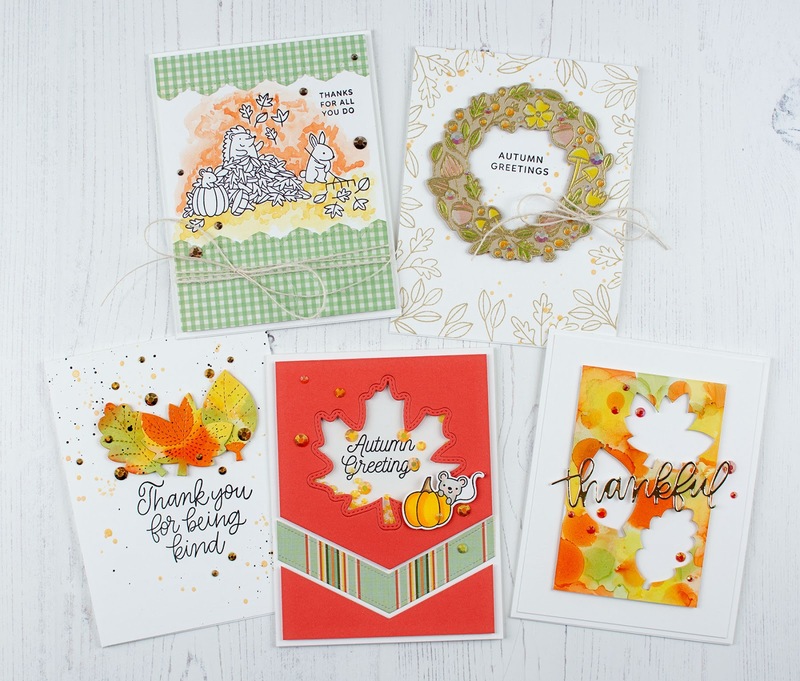 The Main Class will be in the afternoon from 2-4 PM and we will be making these FIVE autumn cards featuring lots of fun techniques including playing with alcohol inks, a shaker card, and heat embossing! These two cards will be featured in two morning Mini Classes (both classes the same, just limited to 10 students each time slot). The times will be 10:30-11:30 and 12-1. 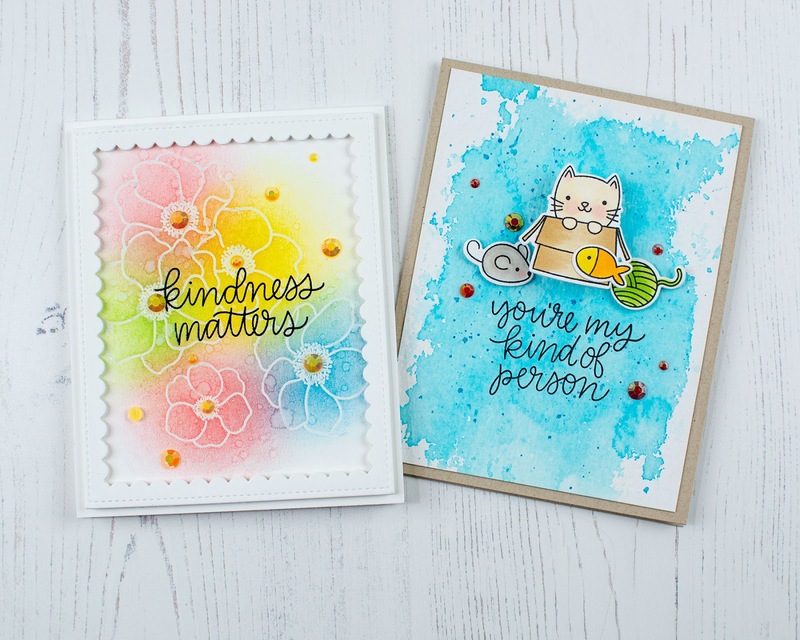 These two cards both use Distress Inks in fun ways - and that cute kitty is on an action wobble as well! Now the fun part - there are a total of 4 $25 Gift Certificates up for grabs - 2 winners for each day - Winners will be picked randomly along the blog hop. Make sure and leave comments by 11:59 PM PST on September 18, 2018 to qualify! Winners will be announced after that on the Pretty Pink Posh Blog! Love the cards the colors are splendid. Love how different they are. thanks for sharing your wonderful cards. They really inspire me to stamp! Wow really impactful but both not too high of a skill level required! I will be casing these cards! Thanks!!!! Wonderful cards. Love the fall scene with the gingham. Beautiful cards. 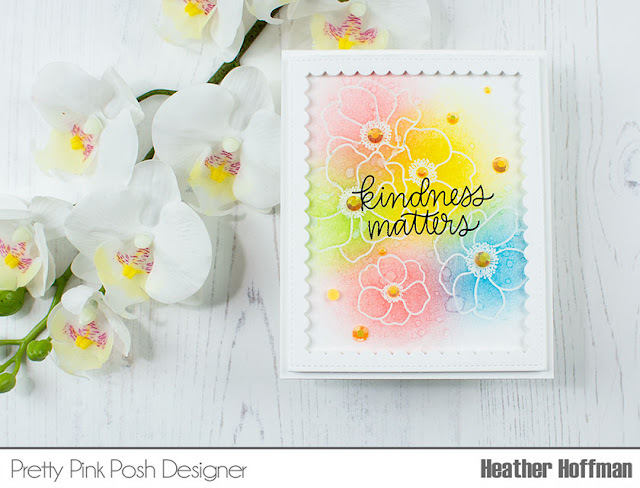 Love the background on the kindness matters card. Very cute! I never would have thought to leave the little critters "plain" and do the background. Thanks for introducing a new idea! I love the your'e my kind of person card. The kitty is so sweet, and i like the watercoloring! ALL of your cards are so dreamy!! Stunning work! Your cards are beautiful ! I specially love how you "played" with the anemones' stamps. Love all the cards. This fall line is so versatile! Fun cards! I love them all but my favorite is your Kindness Matters card. Cute cards! Especially love the pumpkins and critters! I love your style! I like the idea of coloring the background but not the focal image. So much fun! I also have to say how much I love the kitties in this release. TFS! Love all the card ideas! Again more with the Anemones stamp set that I will have to try! Love the cards, especially the colors used. Very pretty cards and a unique style. Like them all. Too bad I didn't live closer I would take your classes. All are beautiful cards but I love the critters playing in the fall leaves the most. That little kitty poking out the box is very cute too. I love fall and these designs really have me anticipating its arrival! I love the fresh, green gingham and the inside scallop frame. Thanks for sharing your art! The kindness matters card is so pretty; love the colors. What a beautiful collection of cards you have created. Lovely! Love your critter card. Super cute. Cute cards. I love the Fall Scene card. I like that style with the image still black line and the color is around the image. Thanks for the inspiration. Such great cards! The critters in the leaves are so adorable! Wow!!! Love your cards, and most especially the sweet little fall scene! I'm a softie for critters! But I do love the bright colors on your flowers too. Great job on both--have a blessed day. Beautiful cards, Heather. Love those espresso jewels, too; so pretty! And the yellow ones, too. Fabulous cards! Your coloring is splendid. Love how different they are. I love all of your cards, especially the Kindness Matters. It’s beautiful. You certainly have been busy!! Laura is such a hoot!! Love the card love the tips. These are beautiful. Thank you for sharing. I love using the ideas. Love these cards! That little mouse in the pumpkin - too cute! 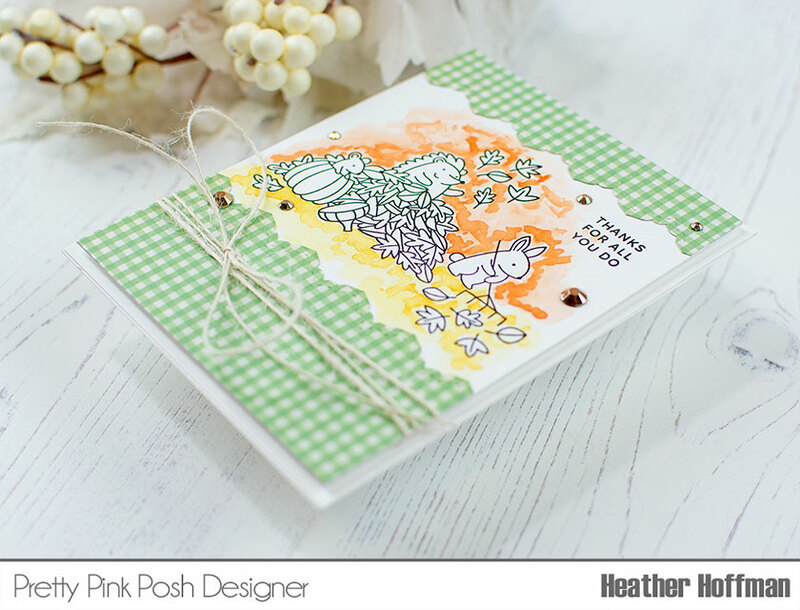 Wow...your cards are beautiful Heather! Those critters and the watercoloring - lovely! Thanks for sharing such adorable cards. Gorgeous cards! Too bad I do not live near Seattle. Your class cards look fantastic! I love all these cards. My favorite is the anemones. The colors and the style are gorgeous. All of your cardsca precious. My favorite is the flowers on the kindness card, I guess because that is what I do a lot of. Thanks for sharing. These are all such beautiful and unique designs. Great job. Lovely cards! The kitty in the box is my favorite. These are all so nice. I love the look of the autumn greetings card with the wreath. These are beautiful!!! How colorful! Heather,I love your pretty new approach to these lovely Autumn cards! Each one is adorable, and I love the soft and subtle color palettes! One of my kids lives in Seattle!! Another good reason to visit! Your cards are lovely! Awesome cards with this sweet release!!!! OMG! All the backgrounds are AMAZING! I really like how you did the stamp with just the lines and made the background colorful! I love all your cards! You've used this new release wonderfully. I am especially fond of the pretty pastels with white embossed flowers of the kindness matters card. It makes me happy. Wow, love all your fall cards. I adore your design of the critter card with the colorful background and leaving the rest uncolored. You really highlighted all the different ways the new release can be showcased. Thanks for the inspiration. Love all of the cards! Your cards are stellar! 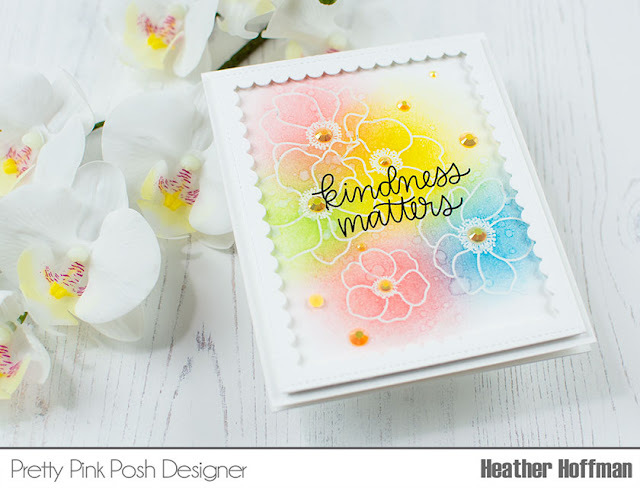 Love the kindness card with the white embossed image and the blended color!! Wow! Also love the kitty card (Wish I could see him WOBBLE!!) The Kind stamp set looks like it would work for a lot of different things! ♥ Almost everything you used here is on my wish list, including those adorable jewels! Love them!! These are all absolutely amazing... I would sign up for class right away if I lived anywhere remotely near you. I loved the way you used the Fall Scene stamp. I saw it and thought of all the coloring it would need.I love how you did the coloring on the outside. Thank you for sharing all your cards. Beautiful cards--I especially love the rainbow floral! Awesome cards, thanks for the chance to win and sharing. I love those playful critters; SWOONING over those anemones!!! This is PPP's best release ever! Heather both your cards are wonderful. Have to say the card with the anemones is my fave. Love the loose blending of colours over the embossed flowers. Can’t wait to see you at the class!! These cards are gorgeous!!! with the fall leaves is a fun idea. My faves are the fall scene and the wobbly kitty. Everyone I know LOVES to get a wobbly. Super job, and thanks for the inspiration. All such cute cards , except for the ones that are lovely. The Fall scene stamp is my favorite. Love your cards! I love your cards! They are so creative and charming! Delightful cards! Love the sweet scene on your first card, and gorgeous colors on your floral card! The class samples are fabulous! Great idea to color all around the image! Great cards. I love the outline coloring. These are gorgeous fall cards. I think my favorite is the first one, because it's such an unexpected style. I really appreciate the creativity that you and rest of the design team share with us! Love all your cards. Wish I lived closer to take your class. So many lovely cards! :) Thanks for sharing. First, love your work! I love the first card where the coloring is around the critters. Second, I am really sad I couldn't sign up for your class at Impress. I saw it listed on their weekly email and I am unavailable. Boo Hoo! I hope you come back soon! That thank you card is so sweet! I like how you left the stamped images white and added your color elsewhere. Beautiful ink blending on the anemone card. I wish I could be in your card class. I just returned from a short vacation in Seattle. Lovely city! Those busy little critters raking leaves just make me giggle. Love these gorgeous designs! Heather, these are fabulous! Love all your projects and your class projects are spectacular! Wow, so many gorgeous creations - I love the new release and especially the way you have featured the goodies. Such an amazing designer - always inspired by your creations!!! Wonderfully sweet and beautiful cards! Gorgeous colors and designs. Oh how I wish I could attend one of your classes! :( I love how you added the orange and yellows around the critters to make it resemble beautiful fall leaves surround them! And I absolutely love the wreath cutout and colouring on kraft with the pretty gold borders!!! These cards are wonderful! I love how you use different techniques to color the images or not color them but still bring interest to the main image. They are all so cute. I just can't pick a favorite!!! What a fabulous bunch of cards!! Love that beautiful flower card!